Acquired from the above by Christian Fischbacher in 1979. Eindhoven, Stedelijk van Abbe-Museum, László Moholy-Nagy, January - March 1967. Mrs Hattula Moholy-Nagy has confirmed the authenticity of this painting. 'My belief is that mathematically harmonious shapes, executed precisely, are filled with emotional quality, and that they represent the perfect balance between feeling and intellect' ('Abstract of an artist', in R. Motherwell, ed., Lázsló Moholy-Nagy, Documents of Modern Art, New York, 1947). 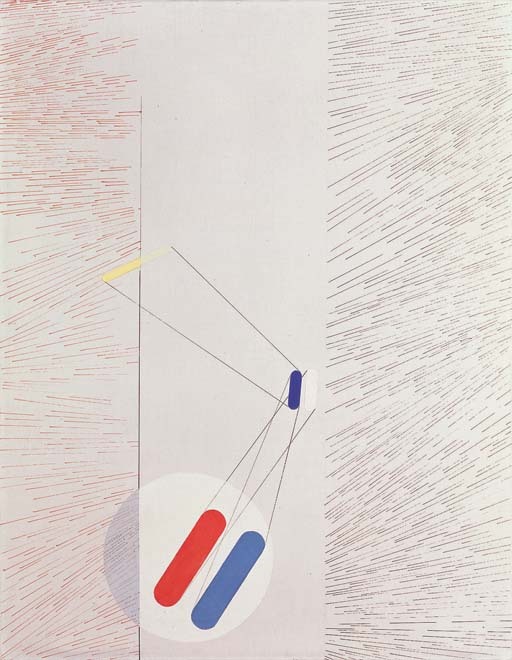 Executed in 1936 while Moholy-Nagy was living in London, LII and LK IIII (lot 410) are outstanding examples of the artist's ongoing preoccupation with finding a balance of pure colour, light and form. Inspired by the effect he had observed and filmed in the Light-Space Modulator that he had invented during his years as a professor at the Bauhaus, in his paintings of the 1930s, Moholy spent much time translating these effects into colour and material form. Using simple colours and plain geometric forms, these two works articulate a sense of the mystery that can infuse even the simplest of shapes when it is subjected to light and movement. Set against a light coloured background, the oblongs of plain colour seem to describe perforations and shadows, implied motion and the presence of light. In the present work, this sense of light is further reinforced by dynamic streaks of engraved lines that again demonstrate a deep sense of mystery and ambiguity in a work of such apparent simplicity. It was in this way, by weaving a sense of the enigmatic but unlimited possibility of simple form and colour, that Moholy hoped to imbue his work with a profound sense of emotion and to establish a 'perfect balance between feeling and intellect'.